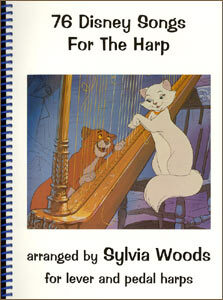 This fun book by Sylvia Woods spans 60 years of beloved Disney songs from movies, TV shows, and theme parks. The songs are fingered, can be played on either pedal or lever harp, and have both lever and pedal changes marked in the music. Some of the songs are very easy to play, while others are more difficult. You're sure to find a great number of songs at your playing level. The lyrics are written between the staves of each song, so you can merrily sing along. 172 pages with Disney illustrations, spiral bound. Includes songs from Aladdin, Alice in Wonderland, The Aristocats, Babes in Toyland, Bambi, Beauty and the Beast, Bedknobs and Broomsticks, Cinderella, Darby O'Gill and the Little People, Davy Crockett, DuckTales, Dumbo, It's A Small World, The Jungle Book, Lady and the Tramp, The Little Mermaid, Mary Poppins, Mickey Mouse Club, The Parent Trap, Pete's Dragon, Peter Pan, Pinocchio, The Reluctant Dragon, The Rescuers, Robin Hood, Snow White, Song of the South, Tale Spin, Three Little Pigs, The Three Lives of Thomasina, Westward Ho the Wagons, Winnie The Pooh and the Honey Tree, Zorro, 20,000 Leagues Under the Sea, and songs from Disneyland theme parks. If you play a lever harp that is tuned to flats, there are 19 pieces in this book that you will not be able to play, because they require A# and E# accidentals. I have made new arrangements for these pieces to accommodate these harps. Please read this article for instructions on how to get these 19 "flat-friendly" arrangements for free when you are purchasing this book, (or if you have purchased this book in the past).